I was never so happy to see what I was hoping and praying for, a King of Swords to come along and save the day! This was the card I drew yesterday, and with the Spring snow storm, that left 6-10 foot drifts completely filling in my long lane, there he was, he came, he saw, he blew snow for two hours! I never got around to posting because I was digging my car out and busy having a meltdown. I felt completely overwhelmed with next to no food, the amount of snow and I was getting a little freaked out feeling very alone, seemingly without anyone to help me. After having a typical what I'll call 'cups' kind of morning, and into the afternoon of waiting. I was so very grateful to finally find someone to get the job done, to free me from over ten days of snowbound Snowmageddon! I don't have many moments like this, and I don't want to apologize for feeling this way. It's just not a good feeling for me, when I do find myself in such a state of mind. Sometimes all we need to do is vent, and talk things out, to share with another who can help to remind us of, and who can exhibit those kind of King of Swords characteristics, in order to bring us around, and this is just what a did, and was able to find those who could be that King of Swords for me. 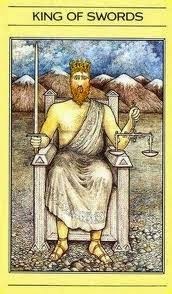 The King of Swords is a clear thinker and with leadership skills. He knows how to approach problems logically, and directly head on without hesitation, he gets the job done, calmly stays the course, in a rational manner. The King of Swords knows what to do in a crisis. He will defend the defenseless, and take a vehement stand for what he thinks is right. He excels in his strategic skills, and reminds me of a Neutrino. Having great intellectual capacities, combined with high principles, and a strong idealistic sense of justice, this determines all of his decisions. He may appear somewhat distant and detached emotionally, but he feels deeply and is a very compassionate individual. "No one is too rich to receive, and no one is too poor to give." It's been a wild February and March. I am SO relieved to have my drive way back and free! Wow. The thaw appears to have begun! Well above freezing temps the last couple days with rain and more to come Hallelujahs all round!